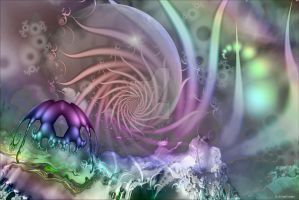 This is a multi-layered fractal created 100% in Ultra Fractal. My gallery and all the images contained therein are Copyright ©2006-2009 AnnaKirsten. All rights reserved. None of the materials contained in my deviantART gallery may be reproduced, copied, edited, published, transmitted, borrowed, duplicated, printed, downloaded, or uploaded in any way without my express written permission. This includes downloading for desktop wallpaper. This is maybe not the most complex fractal ever done but it transports a special mood a lot of emotions. You instantly feel lured into a dream as the title already suggests. The blue colouring and the soft shadind and texturing support this concept very much. The touch of a real secenery with the planet, the water and the clouds give the composition a certain amount of depth and the flower spiral is somehow hovering above the liquid ground. I think this impression could be increased by making the spiral a bit smaller so that it wouldn't be cut off so much at the edges. I also can imagine even a little more clouds or smoke on the water to make this dream a little more confused as dreams usually are. Once again this is a very AnnaKirsten-like fractal art, unmistakable and unique. And so is the artist herself! Love you, my friend! 54 out of 55 deviants thought this was fair. It's a very feminine image and an extremely pretty one which certainly is pleaing to view. Excellent ! Splendid work !!! Like it very much and put it in my faves. Wish you a very nice afternoon ! Very good use of the fractal medium! Love the colors and moods of your work! This is so lovely Anna! Incredible, as always. You are so talented. What a beautiful dream it is...It creates a nice atmosphere. It's amazing. You're very much welcome.The pleasure is mine. That's beautiful. Your art is awesome. 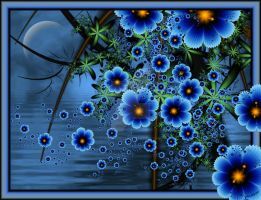 This is so beautifully light and airy, and with all the blue and flowers against a tranquil background, this is a nice fractal. I'm not usually a fan of fractals but this looks lovely. Whimsical, I love the colours!